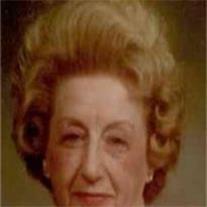 Lucille J. Hehman, of Mesa, AZ died May 31, 2011. She was born August 30, 1924 in Milford, IL. And was the daughter of William and Helen Buss. Lucille married Marvin Hehman on August 2, 1942, they were married for 49 years. She was the proud owner of the Cinderella Beauty Salon in Bloomington, IL for many years. grandsons, two great-granddaughters, one great-grandson and a half-sister Glenna Daugherty that lives in Bloomington, IL. Lucille was preceded in death by her husband in 1991, four brothers and two sisters. Visitation will be Monday, June 6, 2011 from 9:00-10:30a.m., at Bunker’s University Chapel, 3529 E. University Dr., Mesa, AZ, with graveside services following at 11:00a.m. at Mt. View Memorial Park, 7900 E. Apache Trail, Mesa, AZ.